As far back as the Republic era, the Roman army made extensive use of mercenary forces. Reliance on foreign fighters waxed and waned over the centuries, but in the Eastern Roman Empire foreign mercenaries were an integral part of the Byzantine geopolitical game. Enemies were turned into allies, and potential invaders were turned against each other as part of the Byzantine strategy to survive in its declining years. 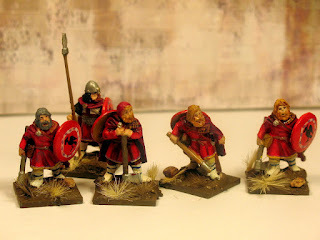 The Varangians were Rus or Scandinavian mercenaries recruited first under Emperor Michael III (r. 842-867), and becoming an elite guard by the time of Emperor Basil II (r. 976-1025). They served as bodyguards for the emperor and fought in Byzantine campaigns in Syria, Sicily and Armenia. 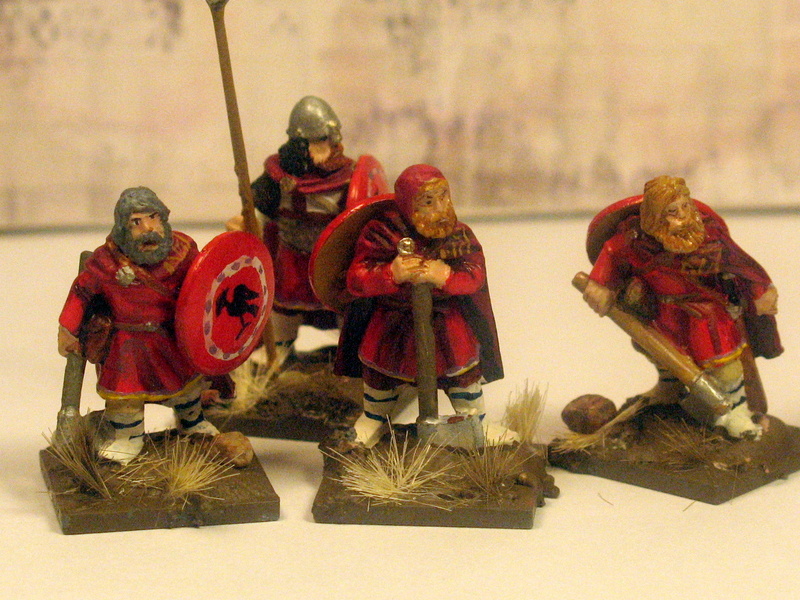 The following figures are all from Crusader Miniatures' Dark Ages line. The eight in robes and bearing axes are from a Palace Guard pack and the spearman is from the Emperor's retinue pack. For historical information, Osprey recently released a Men-at-Arms book on the Varangians. The writing and documentation is solid. The illustrations are detailed and very useful for the miniature painter, despite some stiffness in posing and action. 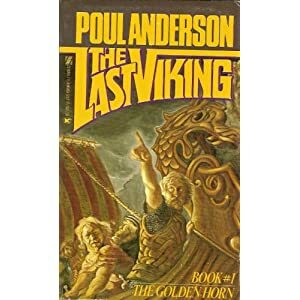 For historical fiction, I really enjoy Poul Anderson's Last Viking series about Harald Hardrada, of which a good chunk is set during his exploits as a leader of the Varangian guard. Sadly, the trilogy is out of print, nor is it available in any ereader format. One of my favorite authors of historical fiction is the previously suggested Stephen Lawhead. With Varangians in mind, his Byzantium is very good. In some respects, it is a stereotypical epic travelogue. A young Irish monk is captured by Vikings and through luck and natural talent, Aidan moves from slave to noble, standing beside kings, emperors and emirs. Much less traditional, and very representative of Lawhead's other historical fiction, is the internal journey of Aidan. His faith as a young monk is studied and routinized, easily maintained in the controlled environment of a monastery. But in the outside world, God's seeming obliviousness to man's cruelty and cravenness shakes his faith, even as he kindles a spark among his pagan companions. At his worst, Lawhead struggles to make Aidan's most mundane activities like eating hot bread feel poetic, but at its best, Byzantium delivers a story that is both panoramic and personal. D'Amato, Raffaele. The Varangian Guard 988-1453. Illustrated by Giuseppe Rava. Osprey Publishing, 2010. Lawhead, Stephen. Byzantium. Harper Voyager, 1997.